In the last few weeks, the friars in Philadelphia have had a number moments of grace. First, there was the Solemn Celebration of the Sacred Triduum. At the Easter Vigil, the parish in Philadelphia received 18 into the Faith of the Church. Beginning on the 3rd Sunday after Easter, the parish also opened its annual observance of the Forty Hours Devotions. 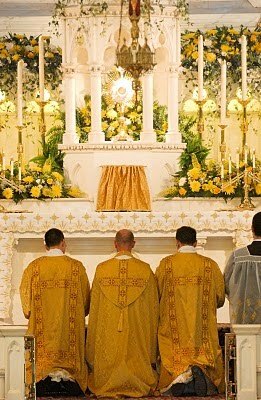 We began with a Solemn High Mass, in the Extraordinary Form of the Roman Rite. Fr James W. Mayer was the celebrant; Fr. 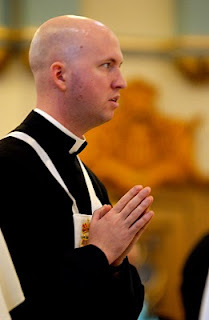 Matthew H. Phelan was the deacon; Br. David M. Spencer, was the subdeacon. 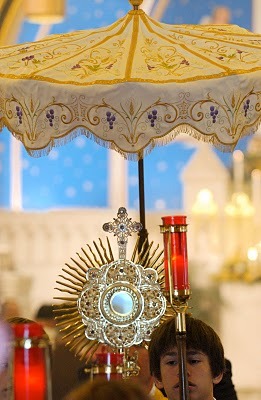 Following the Mass there were three days of prayer and petition before the Blessed Sacrament exposed. Msgr. Joseph Nicolo was the homilist for all three evenings of Vespers. His theme was on the 'image of God'. What is our image? How do we come to that image? Is our image limited? Are we open to expanding our understanding of God, His love and His mercy? Many of his thoughts and words were provocative, calling forth from us to examine our notions and, perhaps, allow them to be transformed by the words of the Gospel. What better place to have them transformed then in prayer before the Most Blessed Sacrament. On the final day of 40 Hours, we were graced and privileged with the presence of His Excellency, Timothy Broglio, Archbishop for the Military Services, USA. He spent time with our community and then presided at the Solemn Pontifical Vespers, in the Ordinary Form. The Church was full with the schoolchildren, Third Order, Altar Boys, Bernadette Society, Knights of Malta, Chaplains the Knights of Mercy and the Knights of the Holy Sepulchre, prelates and priests were in attendance. And, lest we forget, many seminarians from St. Charles Borromeo Seminary, Overbrook. Related to the Counts of Urgel, Peter Armengol was born in Guardia dels Prats (Tarragona) in the middle of the thirteenth century. He spent his childhood and adolescence in a quiet family atmosphere of honesty. But having barely reached the threshold of youth, Peter was drawn by bad company to the abyss of dissolute and criminal life of a bandit. In an encounter of armed people sent by James I to rid the area through which the royal suite was to travel of evildoers, with his sword in his hand, libertine Peter Armengol found himself face to face with his own father, Arnaldo. This providential circumstance made Peter lay down his weapons before his progenitor, ask for his pardon and, with iron will, decide to change his life. 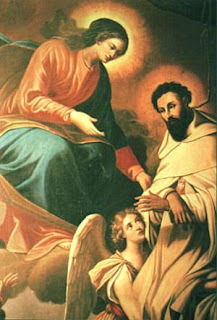 His father’s prestige saved his son from the deserved punishment and Peter Armengol badgered the Mercedarian friars to accept him in the Order since he wanted to dedicate the rest of his life to the work of mercy of the redemption of captives so that the Lord would use his infinite mercy with him. After he was received in the Order, Peter was able to go twice to Moorish lands to carry out the ministry of redemption. On his second trip in 1266, he remained as a hostage for captives in Bejaïa. He had stayed behind as a pledge but the money for the ransom did not arrive in time and he was hanged from the gallows. However, thanks to Mary’s singular protection, he was not hurt. The day after the hanging, when Brother Guillermo of Florence arrived with the money agreed upon, he found Peter alive. As a result of his ordeal, he had a twisted neck for the rest of his life. Upon returning to Spain, for almost forty years, Peter lived in seclusion in the convent of Santa María dels Prats where he died a holy death in 1304. 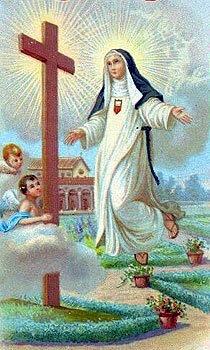 Patron of the Youth, pray for us!! These words should give us courage and consolation and humility to realize that Our Lord -- despite our sinfulness and weakness -- still reaches out to us, desiring to be in relationship with each and everyone of us in this world.... Let us not waste the moment. Blessed Mary Ann was beatified by Pope Pius VI; her body lies incorrupt in Madrid, to this day. On a sidenote -- the Friars in Philadelphia will begin the Annual 40 Hours Devotions tomorrow -- April 18th. The opening celebration will be a Solemn High Mass, at 1130am. All locals and even those who are some reasonable distance away, please come and join us as we begin to give a clear and focused witness of our Love for the Holy Eucharist.